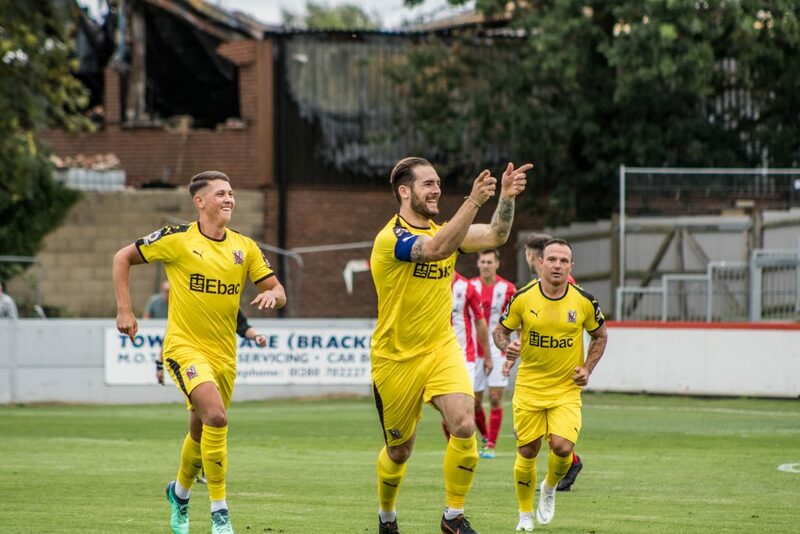 Darlington striker Reece Styche scored a hat trick inside the first 23 minutes as Quakers turned on the style at St James Park — and Simon Ainge chipped in with another! Quakers scored three times in five minutes to take a firm grip on the game and set themselves up for the first win of the season. 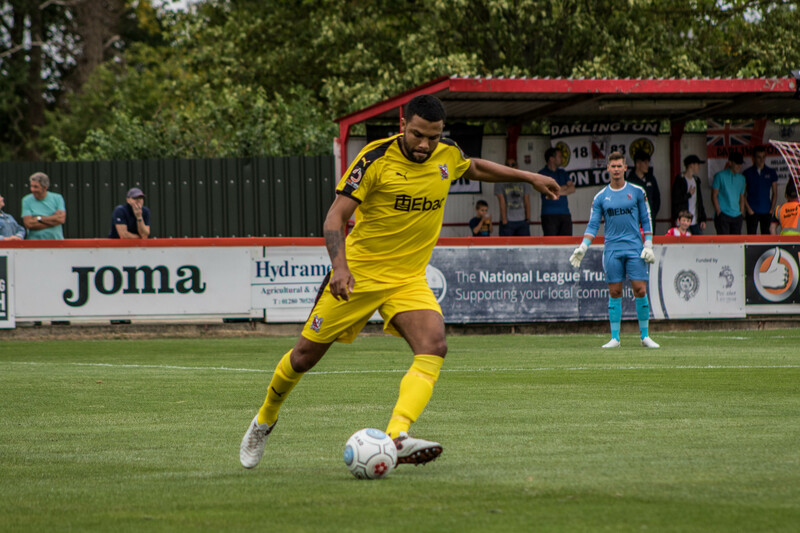 Styche and Ainge caused endless problems for the Brackley defence all afternoon, and when it mattered in the second half after Brackley pulled a goal back, the defence was outstanding. Quakers threatened in the second minute. Terry Galbraith found Alex Henshall with a good ball up the left, and his cross was headed away as far as Elliott who went down under a challenge. But Brackley levelled after 6 minutes when a corner was swung in by Shane Byrne from the left, and Jimmy Armson headed past Jonny Maddison, but Maddison claimed that he was fouled and protested in vain to the referee. Brackley were awarded a free kick for a foul on Walker on the edge of the box on 11 minutes, but Byrne’s curler went inches wide of the right hand post..
Quakers were stretched when Armson got round the back and set up Murombedzi, but he pulled his shot wide, and then Maddison got everything behind a 30 yarder from Byrne. At the other end, Styche had another effort from outside the box blocked. Quakers went 2-1 up on 21 minutes, when Ainge cleverly flicked the ball on for Styche, who kept his cool and slotted the ball into the bottom right hand corner past the advancing keeper. Amazingly, it was 4-1 on 26 minutes, when Styche played the ball to the left for Ainge, who sidestepped a challenge and beat Lewis with a right foot shot across him into the net. Superb stuff. Ainge then claimed he was fouled in the box as he went for a Henshall pass, but the referee gave the free kick the other way. The game then became relatively subdued as we headed towards half time. 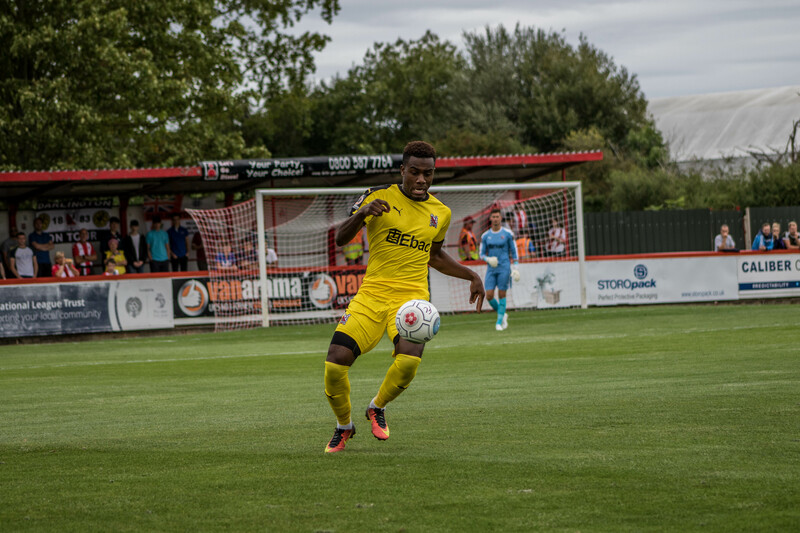 Brackley pulled a goal back on 47 minutes, when Armson crossed from the right hand side for Ndlovu to nod into the bottom corner. But Quakers nearly went 5-2 up. Styche was fouled on the left, and Henshall’s low free kick took a deflection and went just wide, then Thompson tried to lob the keeper from 50 yards, but the ball went over the top. Brackley nearly scored on 58 minutes. Matt Lowe cut in from the right and hit a left foot shot that Maddison did well to parry, and then he recovered to save the follow up from Ndlovu. Brackley made a sub on 59 minutes, Fairlamb coming on for Glenn Walker. But Thompson nearly made it 5-2. He made a great run down the right, played a 1-2 with Wheatley and volleyed just over. Quakers made a sub on 67 minutes, Nicholson replacing Henshall. And Thompson popped up again on the right, dribbling past a defender and forcing Lewis into a good save. At the other end, Maddison needed attention after clashing with Ndlovu,but was soon able to continue. Quakers made their second sub on 79 minutes, hat trick hero Styche was replaced by Hughes. Brackley made their third sub, taking off defender Connor Hall and replacing him with striker Daniel Nti in their last throw of the dice, then Thompson was subbed by Harvey Saunders on 85. But overall, with the defence outstanding, Maddison had very little to do in terms of direct action in the closing stages of the game, and Quakers stayed well in control. Liam Hughes had a well hit free kick saved in the last minute.